A Rocket Lab Electron rocket lifts off from New Zealand on Jan. 20, 2018, on the booster's second-ever spaceflight. The Electron delivered four small satellites to orbit on the mission, which was called "Still Testing." It will soon be business time for spaceflight startup Rocket Lab. The California-based company plans to launch its first commercial mission, dubbed "It's Business Time," next week. If all goes according to plan, a Rocket Lab Electron booster topped with six satellites and a technology demonstrator will lift off from the startup's New Zealand launch site late on the night of Nov. 10. The company will follow up "It's Business Time" soon, with the ELaNa-XIX (Educational Launch of Nanosatellites No. 19) mission for NASA in December. ELaNa-XIX will deliver to orbit 10 tiny cubesats, which were developed by various university groups and NASA research centers. The back-to-back liftoffs are in keeping with Rocket Lab's long-term vision, which involves making spaceflight more routine and accessible via Electron. The 57-foot-tall (17 meters) rocket can loft payloads weighing up to 500 lbs. (227 kilograms) for just $5 million per flight. "This year has been about scaling our team, facilities and processes to enable reliable, high-frequency Electron launches to orbit," Rocket Lab founder and CEO Peter Beck said in a statement. 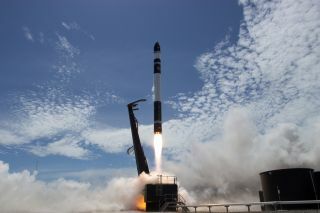 "The ability to build and test multiple vehicles, while operating concurrent launch campaigns, strongly positions Rocket Lab as the industry leader opening access to space for small satellites." Though this month's launch will mark Electron's operational debut, the mission will not be the booster's first trip to space. The rocket flew demonstration missions in May of 2017 and January of 2018, successfully delivering four small satellites to Earth orbit on the latter flight. A look inside Rocket Lab's huge new facility in Auckland, New Zealand, which includes a mission control center that will command all future Electron launches. Both of those previous missions also flew out of the New Zealand site, which is on the North Island's Mahia Peninsula. But Rocket Lab will also launch from Virginia's Mid-Atlantic Regional Spaceport, perhaps as early as next year, Beck announced last month. The six satellites launching on "It's Business Time" were built by Spire Global, Tyvak Nano-Satellite Systems, Fleet Space Technologies and the Irvine CubeSat STEM Program, Rocket Lab representatives said. The technology demonstrator also being launched is a "drag sail" designed to combat the growing space-junk problem by helping satellites deorbit more quickly. These payloads will launch initially to an elliptical "parking orbit" that will take them as close to Earth as 130 miles (210 kilometers) and as far away as 310 miles (500 km). Rocket Lab's "kick stage" will then circularize the payloads' orbits at 310 miles, company representatives said. "It's Business Time" was originally supposed to launch this past April, but Rocket Lab delayed the liftoff multiple times to deal with a balky rocket-motor controller and other issues.